Fall in Forest Park — as in life — is a time of transition and reflection. The leaves change colors and eventually drop, littering the beds where they can lead to too much moisture for the other plants. 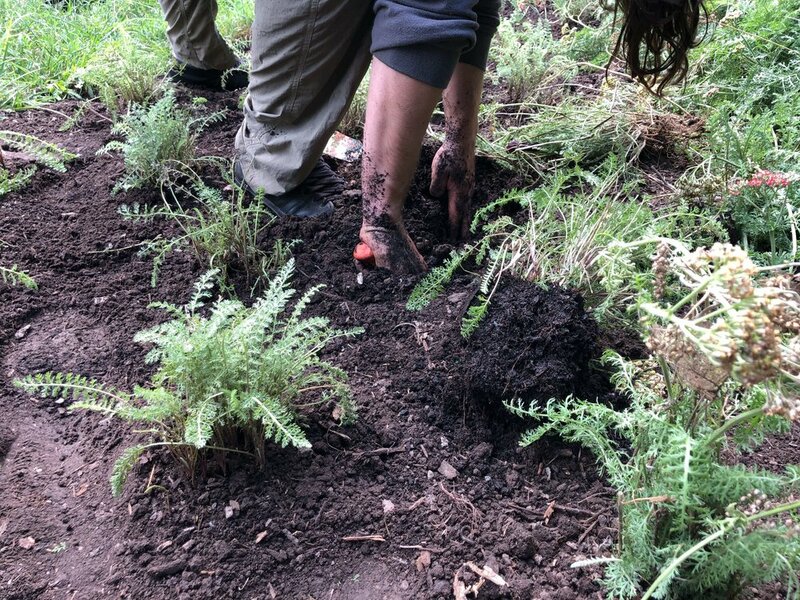 Plants that didn’t survive the summer also gather on the ground, offering a haven for potentially harmful diseases and insects. And of course, everything needs to be prepared for the cold to come. But that’s not all. 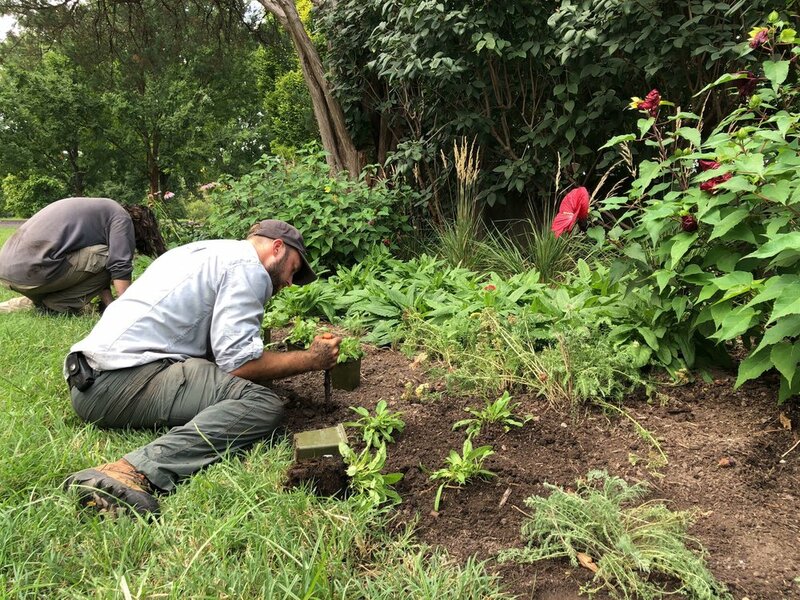 As part of their conservancy’s mission, the Forest Park Forever land management team must also study what went well and what didn’t over the summer to help future plantings succeed. Forest Park Forever Horticulture Superintendent Roman Fox leads a team of horticulturalists, gardeners and seasonal volunteers who do all of the necessary maintenance to help the plants make the switch from summer to winter, ensure that they will thrive in the spring and perform several delicate balancing acts to maximize their plants’ beauty no matter the season. As fall continues, Fox’s crew will be busy full removing fallen leaves from the beds — but unlike for St. Louisans all over town, there’s no bagging and hauling involved. Crews also perform selective pruning of plants and deadhead to remove plant material that’s died during the growing season. But in Forest Park, nothing dies in vain. Of course, that work is never-ending, because every year is different. For example, Fox says the summer of 2018 was unique, with a relatively cool, wet July and August. In some areas of the Park, creeping junipers continued to struggle, for example. Mulching is also crucial in fall, because some plants are sensitive to the winter cold. “We do extra mulching for them so they are a better blanket over the winter,” says Fox. However, greenscape maintenance is only part of the work. 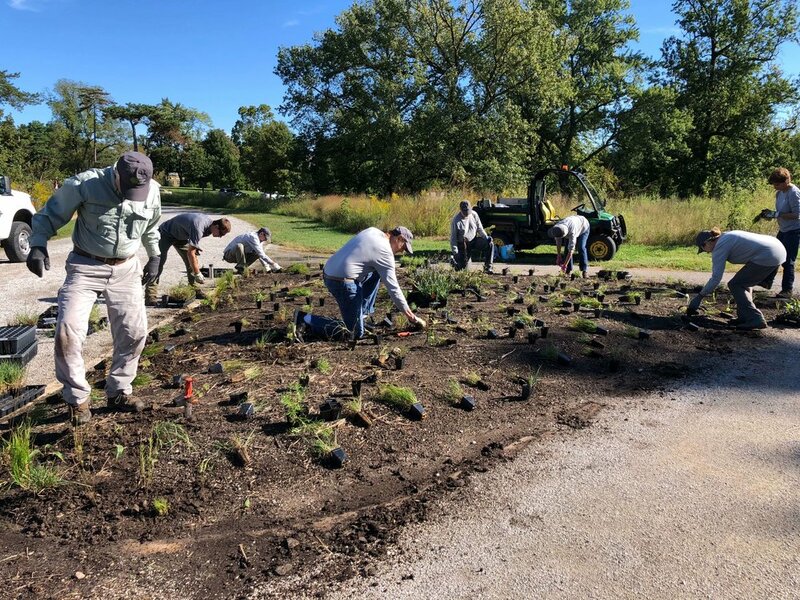 Fox will be leading three big planting projects in three zones of the Park this fall, including about 4,700 small shrubs, grasses and perennials and planting all the tulip, daffodil and other bulbs that will bloom in spring. Fox notes that despite the bulbs’ promise of spring and summer color, color is essential in the fall and winter, too. This fall, visitors will see black-eyed Susans, goldenrods and purple asters blooming throughout the Park. Many of the grasses are producing seed heads that feature attractive fall colors, almost like trees. “The grasses are starting to earn their keep,” Fox says. More specifically, Fox adds that his team will replace dying shrubs with exciting plantings to frame the Edward Bates Statue at Fine Arts Drive. At the World’s Fair Pavilion, a declining population of caryopteris have been replaced with yarrow ‘Paprika’ and hibiscus, whose red will complement the Pavilion’s terra cotta roof, contrasting with the blues of some of the architectural grasses. The Hampton Ave. roundabout landscape bed has also been updated with perennials and grasses that can maintain the harsh conditions. But don’t wait! The displays will end with the first heavy snow. Then, cleanup begins — but spring is never far off. Fortunately, Forest Park Forever’s land management team will be ready. They carefully draw up their plans for spring and summer displays far in advance.